Austrian varietals take pride of place in the Hahndorf Hill portfolio and the wine racks of many of our customers. 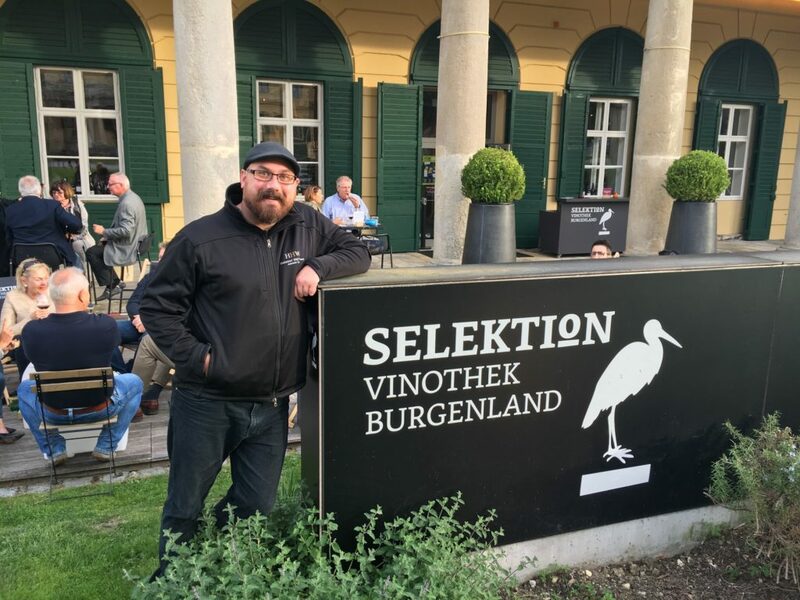 My mission was to immerse myself in Austria’s world-famous wines and wine regions to gain a better appreciation of the geography, styles, culture and people that turn out such consistently enchanting wines. Given the enormity of such an assignment I needed a strategy, so I decided on “divide and conquer”. 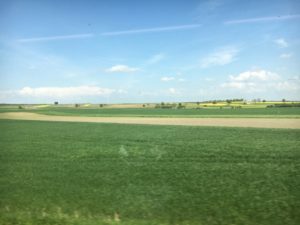 Unlike almost all Australian wine regions that produce both reds and whites, the Austrians (for the most part) pick a side, so I devoted my first few days to Austria’s red heartland, the region of Burgenland. The capital of Burgenland is the large picturesque town of Eisenstadt, only a short ride by train from Vienna airport. It was a beautiful clear and warm afternoon as I stepped off the train to a stunning vista of church spires, museums and stately homes climbing the hill on which Eisenstadt is built. The very well trained staff were more than happy to pull out all the stops for a true believer in what has made their region famous: Blaufrankisch, Zweigelt, St Laurent and blends. After testing my credentials with a “decoy” wine, they told me to disregard the menu and strap in for the staffs’ favourites arranged into flights. Hillinger “Jois” Gruner Veltliner 2013, from the region of Leithaberg. 13.5%. The rich golden straw colour of this wine gave me a hint of what I was in for. Honey and toasted buttery bread from the liberal use of French oak leapt from the glass to tease and provoke the nose. Creamy spiced pear and stewed apple demand your attention at first then the famous white pepper notes and very well balanced acid keep this animal on a tight leash. I am a big fan; this wine would appeal to lovers of big rich Chardonnays and Rhone blends. Moric “Haus Marke” 2014 Cuvee, from Grosshoflien. 12.5%. A blend of the region’s superstars, Blau 40%, Zwei 40% and St Laurent 20%, this wine had a nose that captivated me straight away. Musky plum, cherry, white pepper and a slight bloody aroma all work together to build a platform for the curiously light palate. White pepper and sage upfront, then delicate oak and woody spices carry you through the long finish. Grazing platters of cured meats, cheese, dried fruits and olives would be the perfect way to enjoy this gem. Kloster Am Spitz “Muschelkalk” 2014, From Purbach. 14%. Dark crimson and burgundy in colour with a distinct clearing rim, this Blau/Cab Sauv blend has the most perfumed nose yet. Reminiscent of fine pinot with aromatics of heavy, ripe plums and cherries tail off to delicate and slightly medicinal notes. Dry red and black fruits waltz gracefully with woody spices, while the oak/acid balance is spot on. This wine had the highest alcohol so far but was the most composed and very Aussie friendly; I could very easily blow a week’s wages on this one! Side Note: Eisenstadt’s skyline is dominated by the bell tower of the Domplatz Cathedral, which needs only the flimsiest of excuses to peel out across the town. This combined with the resident population of roughly 17 trillion cuckoo birds (no two of which agree on the time) makes for a background soundtrack of joyous ding dongs versus constant avian objection and dissent. The spiritual centre of Austrian reds is the small village of Deutschkreutz, a town in the region of Mittelburgenland close to the Hungarian border. Deutschkreutz identifies as “red centric” but not in the sense the typical Australian consumer of Barossa or Coonawarra wines would recognise; the wines here run the gamut from delicate and sophisticated rosè through to medium-bodied beauties and titanic oak bombs. Regardless of variety, style, region or price, balance is the metric by which we must measure quality and there are scores of well balanced and exciting wines from all over Burgenland to be found in the Deutschkreutz Vinatrium. A self-service co-operative on the high street only a short walk from the train station that has over 100 local reds open to taste at any one time, you can work your way through them all for only 15 euros. Deep underground in a converted cellar a lucky wine fan can move from station to station tasting bottles from all over the region and covering every style and price point. Blaufrankisch is the dominant variety in Burgenland, with Zweigelt, St Laurent, Cabernet and Merlot also readily available. 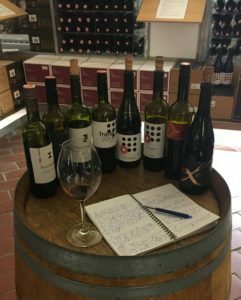 I tasted several excellent straight varietals but it was the blends or “cuvee’s” as the Austrians call them that made the biggest impression on me. Rotweingut Lang, Blaufrankisch Reserve 2013, 14%. Dark as night with just a suggestion of purple at the rim this magnetic red is perfumed with earthy black/blue fruits and violet floral notes. True to form this wine delivers exactly what the nose and colour promised; dark brooding forest fruits, earthy spice and a whisper of fine oak. Clean acid and chalky tannins make for a satisfyingly long finish. An exceedingly strong group of blends got me very excited. If I were to peer into a crystal ball I am sure I would spy a Blau-dominant blend in Hahndorf Hill’s future, and if the range I tasted was as typical of Burgenland’s production as I was led to believe, than we will has some very stiff competition. The stand-out examples all showed delicate spicy and violet aromatic notes on the nose with cured meats, woody spices and dark forest berries complemented by complex and delicate tannins on the palate. All had stamina and would be a very welcome guest at any table. Regional Austria is very observant of their religious traditions, Sundays in particular are very special. So although the excellent Vinatrium was open, very little else was. 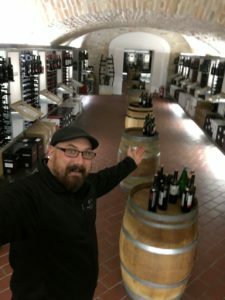 Deutschkreutz is home to several cellar doors or “weinguts” as they are known in Austria including the world-famous Hans Igler and Gesellemann, but both are open by appointment only, so call ahead. Side Note: I have been working on an analogy to describe the way Blau works in a blend and I think I have it. Blaufrankisch is the Phil Collins of the wine world, a stellar solo act but an absolute superstar in a band. The Cuvees I tasted today have convinced me that when blended with care Blau, Zwei and St L become greater than the sum of their parts. A train ride of 40 minutes from Eisenstadt across the open plain to the north/eastern shores of Lake Neusiedl brings me to the penultimate stop on my tour of Austria’s red country. Gols is a small village that differs from those I have visited so far; it is noticeably greener with wider tree-lined streets and more open spaces. Gols puts me in mind of several Welsh villages I visited as a boy and is home to many wineries, the Weinkulturhaus Vinothek and my new bestie, Gerhard Pittnauer of Pittnauer Wines. The Weinkulturhaus offers tastings of most of the local producers’ entry level wines and is a good place to start. I tasted around 20 wines for 15 Euros and while the co-op is open to anyone looking to explore local wines, my next experience was not. After calling in every favour Hahndorf Hill has ever earned and deploying no small measure of my own charm, I was granted an appointment with the famous Gerhard Pittnauer. Since inheriting the winery from his father in 1984 at just eighteen, Gerhard (we are on a first name basis now) along with his wife Brigitte have worked tirelessly to reinvigorate the once crippled local industry. The Pittnaur commitment to excellence paired with a focus on the “Holy Trinity” of Blaufrankisch, Zweigelt and St Laurent has resurrected not only his own business but along with a few like-minded neighbours, has helped to restore the reputation of a region that has been under vine since Roman times. I have strolled through hundreds of vineyards, tasted through countless barrels and worked through entire portfolios before, but this was special. Gerhard was incredibly generous with his time, experience and wines. I could not find a wine in his whole range that I would not max out at least one credit card on. I will not soon forget Gols. I could have spent all day in Gols but I was told a village named Rust on the opposite side of the lake was a must-see so I made my way over. Arriving in mid afternoon I could tell after only a few minutes that I had done myself a disservice by not allocating a whole week to the most arresting village yet. Rust was established over 1100 years ago and has elegant, winding streetscapes and architecture. Whilst home to many cellar doors the real icons of the village are 18 nesting pairs of stalks. The stalks make their nests on the chimney stacks of a select few homes and businesses; it is considered very lucky and is a source of tremendous pride by the residents to have their chimney chosen by a pair of stalks. One winery that must be singled out is Giefing; the wines are made with care, passion and are very reasonably priced. They were also happy to stay open after hours, insisting that I taste everything they thought I needed to. Lovely wines, lovely people. Summary: Burgenland is a vast plain of gently rolling hills clad in every shade of green. At its heart is Lake Neusiedl, an immense but very shallow body of water that has a significant effect on the region’s weather, particularly in the hot summer months. There is something universal about small country towns and villages the world over; the pace and rigidity of visiting city folk is anathema to the calm and open-hearted people that make such places their home. I was embraced and welcomed by the locals, particularly the kids who would giggle as they fed me constant questions just to hear me respond in a language they were familiar with but delivered in the most bizarre accent they had ever heard. Side Note: Almost everyone claims a familial tie to Arnold Schwarzenegger! Next month: Jack’s visit to the Kamptal wine region. This entry was posted in Adelaide Hills, Adelaide Hills wine region, Blaufrankisch, cool climate wine, Gruner Veltliner, Hahndorf, Uncategorized, wine, Zweigelt, Zweigelt Australia and tagged Adelaide Hills, Adelaide Hills wine, Adelaide Hills winery, cool climate wines, Diurnal variation temperature grapes, Gru, Gruner Veltliner, Hahndorf Hill Gruner Veltliner, New Planting, St Laurent, Zweigelt, Zweigelt Australia. Bookmark the permalink. 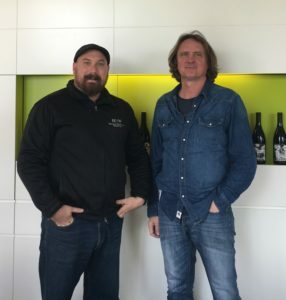 DAN TRAUCKI on Adelaide Hills – the confirmed capital of Gruner Veltliner in Australia!